This year will see the launch of AMD’s Zen core which is a completely new architecture to be embedded on next generation FX and Opteron CPUs. The Zen core is coming to enthusiast first followed by server parts and there’s no doubt that AMD will also have Zen based APUs next year, featuring some major improvements in both dGPU and CPU department. The updated AMD family of APUs is suggested to be known as Raven Ridge. APUs have been a major investment front of AMD on the mobility sector. Their entire mobility processor lineup consists of APUs. 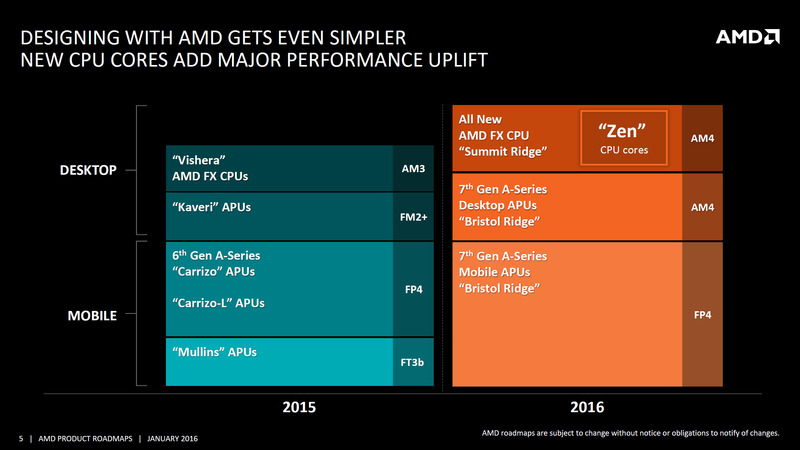 It’s no hidden fact that AMD has a more modern APU lineup on the mobility front compared to the desktop platforms. The top Carrizo APUs were available first on the mobility platforms and will launch on the desktop platforms this year with AM4. AM4 is the name of the new platform that will deploy two modern lineups from AMD, Summit Ridge and Bristol Ridge. The Summit Ridge processors are the first processors from AMD to utilize their next generation Zen core while Bristol Ridge brings the efficient Carrizo design on desktop PCs. The Bristol Ridge family is entirely a Carrizo lineup on the desktop platforms. With Carrizo, AMD managed to get a lot of performance per watt improvements. AMD has stated that these improvements are close to 2.4x perf / watt, about the same as what AMD is getting on Polaris GPUs this year. Bristol Ridge will deploy a range of new features, enhancing the I/O capabilities of modern day APUs and delivering better IPC. We even heard of a 16 CU APU being launched under the Bristol Ridge lineup but whether this APU is just a rumor or something that might launch later in the timeline is expected to be seen. Bristol Ridge is all great for consumers who want to built a modern PC with decent graphics power however it doesn’t bring anything new on the drawing board while Summit Ridge uses the Zen core. For users who want the Zen core on APUs, they should for Raven Ridge which is the first Zen based APU lineup from AMD. The line of APUs not only deploy the next-gen, 14nm Zen architecture but also feature other enhancements that range from higher bandwidth, faster and efficient dGPUs and performance parity with modern day consoles. 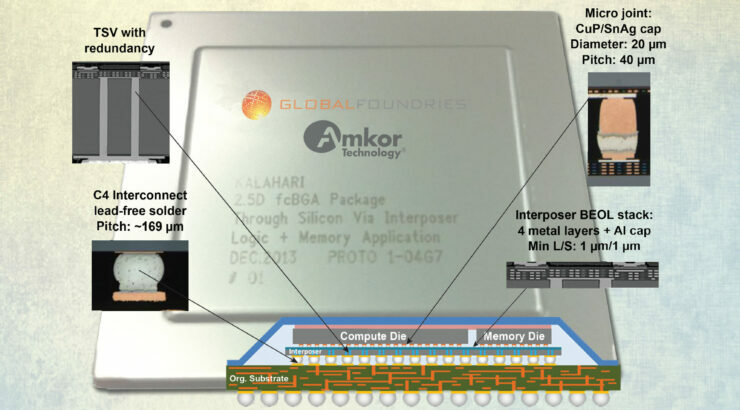 Samsung’s 14nm FinFET process which Globalfoundries has licensed is going to be the basis of all of AMD’s next generation CPU, APU and GPU products. The company’s Chief Technology Officer Mark Papermaster made the announcement last year that the 14LPP process – Samsung’s high performance 14nm process – will be leveraged across all of AMD’s future products. 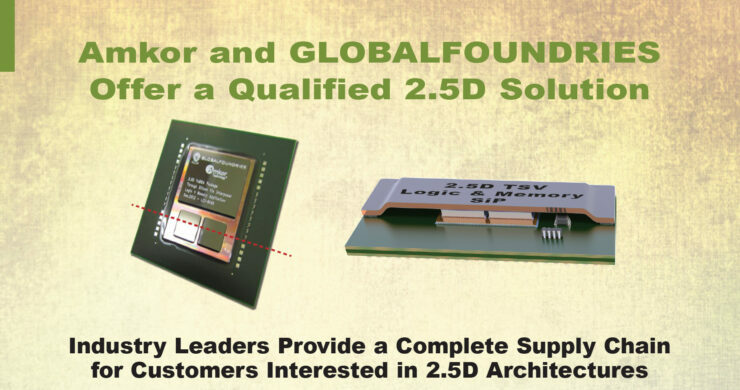 It is exciting to know that Raven Ridge will be a 14nm design from top-to-bottom. Since these APUs arrive in 2017, we can expect the Polaris GPU architecture to be deployed on these APUs which delivers up to 2.5 time performance per watt improvement compared to current generation GCN architecture. 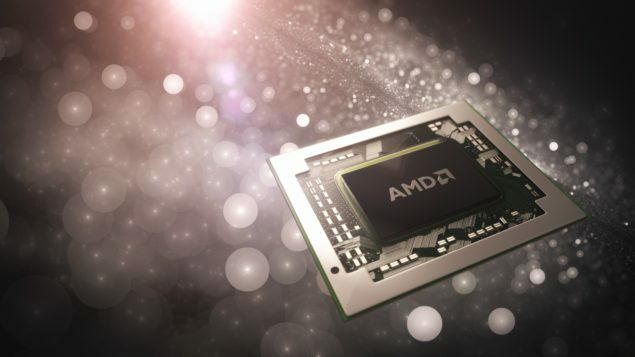 AMD’s Carrizo APUs currently deploy the same GCN architecture which is found on Tonga and Fiji and Bristol Ridge is expected to keep the same design. Raven Ridge which deploys the GCN 4.0 GPU design will not only help APUs perform faster in graphics performance but also much more efficiently. AMD’s first Polaris demo was of an entry level chip which delivered great performance for a sub-40W design. But with more graphics power comes more demand of bandwidth which unfortunately doesn’t provide a lot of bandwidth to faster graphics cores. Intel’s solution to feed higher bandwidth was faster eDRAM cache but AMD is deciding to go the HBM route. The HBM will act as fast DRAM which the GPU will have full access to. 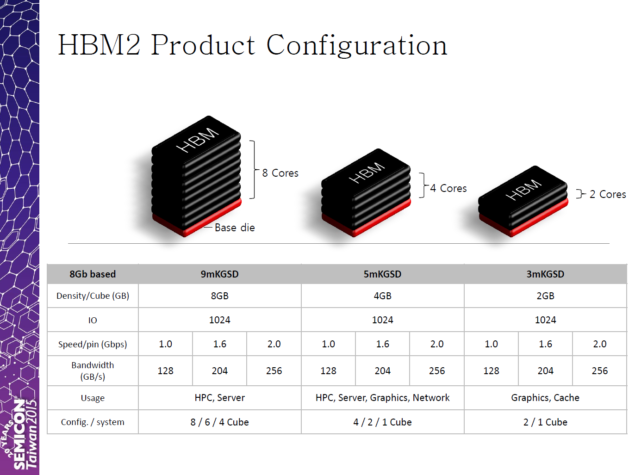 That’s the part two of the statement by BitsnChips who state that Amkor packaging AMD APUs is a hint that these are going to deploy the fast HBM DRAMs. 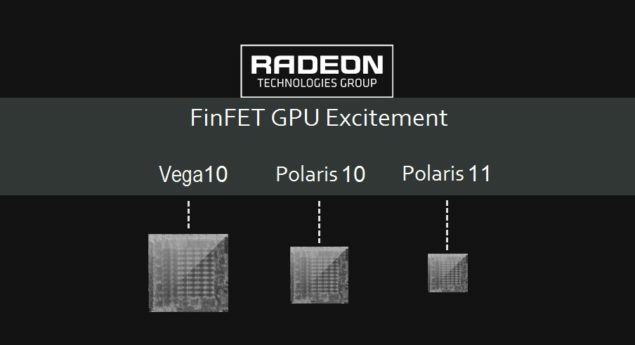 Which we’ve also seen hints of in official AMD slides. It’s not known what specific amount of HBM will be featured but a single HBM2 stack can deliver as much as 4 GB memory and 256 GB/s bandwidth. You can clock it up and down but the most entry level stack can still get as much as 128 GB/s. 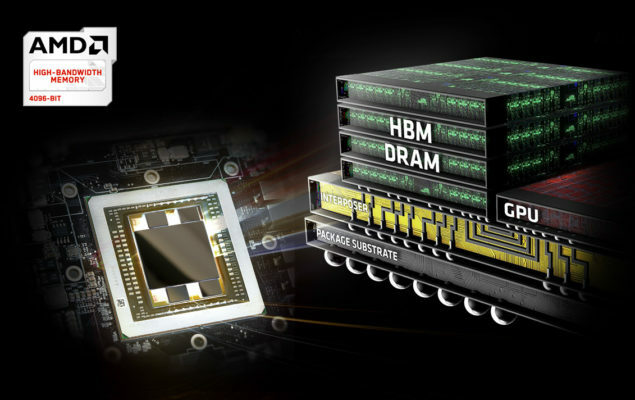 AMD’s HBM partner SK Hynix will begin production of 4 GB DRAMs in Q3 followed by 8 GB DRAMs in Q4 2016. They also have 2 GB but there’s no date issued how ever these low VRAM DRAMs sound most ideal for Raven Ridge APUs. Regardless of the amount of VRAM, the bandwidth increase will be more than enough for the dGPU on board Raven Ridge and the 40% IPC increase just from the Zen cores will lead to a huge performance gain on AMD’s next gen APUs. The performance of AMD Raven Ridge is expected to reach or even exceed the levels of Xbox One and PlayStation 4 performance due to better CPU, GPU and memory architecture. The Raven Ridge APUs will hit the AM4 platform and will be exciting to see how AMD handles these high-performance mainstream / consumer APUs when they launch in 2017. Product Segment Mainstream Desktop and Mobility APU Performance Desktop Processors "FX" Mainstream Desktop and Mobility APU Performance Desktop Processors "FX" Mainstream Processors "Kaveri/Godavari"